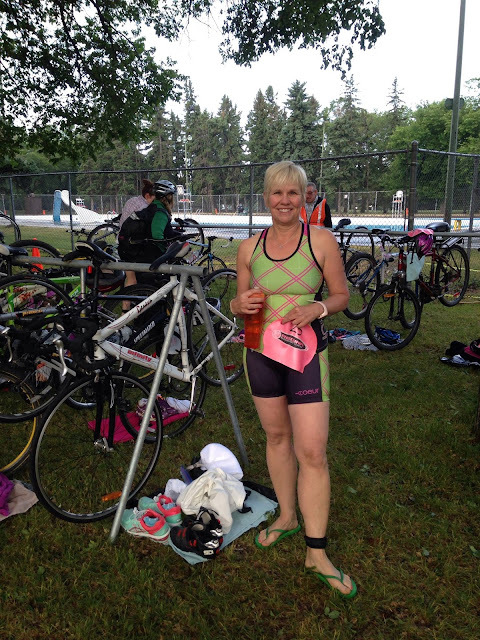 Two years ago this August, I completed my very first triathlon. It was one of the most exciting events in my life, and obviously a turning point as well. When I hear about other people getting into the sport for the first time, my heart races with excitement for them because I hope it changes their life in the way it changed mine. While the end of the summer is approaching, I'm sure there are still many of you out there that will be completing your first triathlon soon. I initially put these tips together for my mom, who did her first triathlon in June, and I wanted to share them with everyone else too. Cheers to challenging yourself and TRI-ing something new! If you have any questions, feel free to email me or connect on the Happy Triathlete Facebook page. Mom ready for her first TRI! Remember, you've trained so hard! You have made huge strides and you are ready to put all that hard work toward your race. Drink lots of water in the next few days! Practice your transitions a few times. Here are my tips on setting up your T-Zone. Set out all of your gear and make sure you have what you need. See my checklist here. Eat breakfast well in advance of your race (aim for 2-3 hours pre-race). Eat something that will fill you up and that you are used to eating. Bring something small to snack on about 20-30 minutes before the race start. For example, nuts, a banana, or a granola bar and have a few bites if you're starving as you wait for the race to start (don't eat the entire granola bar though). Make sure your bike is in the right gear (or an easy gear) before the race starts so it is easy to get going when it is time to ride. Warm-up! Do a light 10 minute jog around the transition zone (note the entry and exit for the swim, bike and run) after you've set up your stuff, and then head over to the water and hop in to get acclimated. Stay calm, don't panic on the swim. If you need to flip onto your back for a minute or do some breaststroke, do it! Take a deep breath and continue when you're ready. Remember you have to put your helmet on before you can touch your bike and keep it on until you re-rack your bike at the end. You have to cross the bike mount line before getting on the bike. Start "easy" on the run. You'll be going way faster than you think! But it will feel hard. Then build toward the finish. Smile as much as possible, have fun, say thank you to the volunteers, give little kids high-5s! Tell someone to take lots of pictures! !